The quality of Williamson County’s public and private school systems remains our top economic driver. The P-12 School System in Williamson County is among the very best in Tennessee and allows young families unparalleled educational and extra-curricular opportunities. Post-secondary options abound in the Nashville region, from our brand-new Columbia State Community College campus in Franklin, to nationally recognized institutions like Vanderbilt and Belmont. Williamson County Schools will serve more than 40,000 P-12 students at 48 school sites during the 2018-2019 school year. This represents 10 high schools, 11 middle schools, and 27 elementary schools. 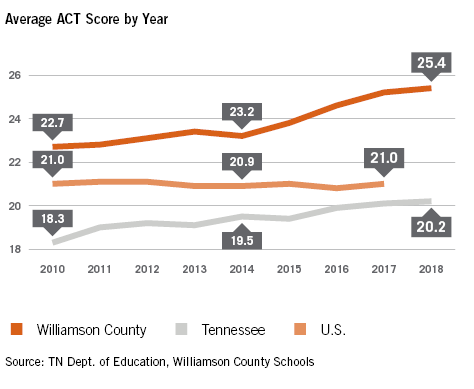 Williamson County students continue to earn achievement scores that rank among the highest in the state of Tennessee. The district’s graduating class of 2018 posted 95.9% graduation rate, and an average ACT composite score of 25.4, the highest in the history of the district. This performance is significantly higher than the nation and state of Tennessee, which posted an average ACT of 20.2 during the same period. An educated workforce is integral to a prosperous business environment. 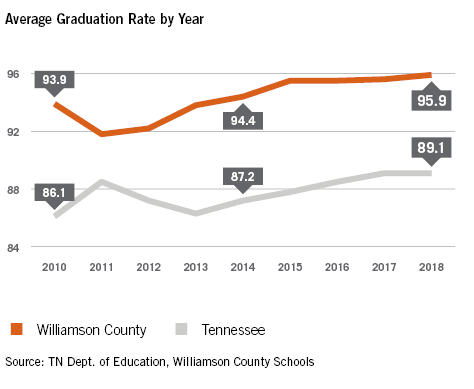 In addition to Williamson County’s lauded P-12 schools, the Nashville region boasts many prestigious colleges and universities, and an estimated 60% of post-secondary graduates remain in the region after graduation. From 2012 to 2016, Williamson County welcomed many new residents from across the country and around the world. The greatest number of residents relocating domestically are from large metropolitan regions across the U.S., including Los Angeles, Phoenix, and Chicago. Internationally, during the same time period, Williamson County welcomed nearly 1,000 people from Asia, 200 from Europe, and nearly 200 from South and Central America. 58% of Williamson County residents were born outside the state of Tennessee, evidencing people from many different regions have become comfortable calling Williamson County home. 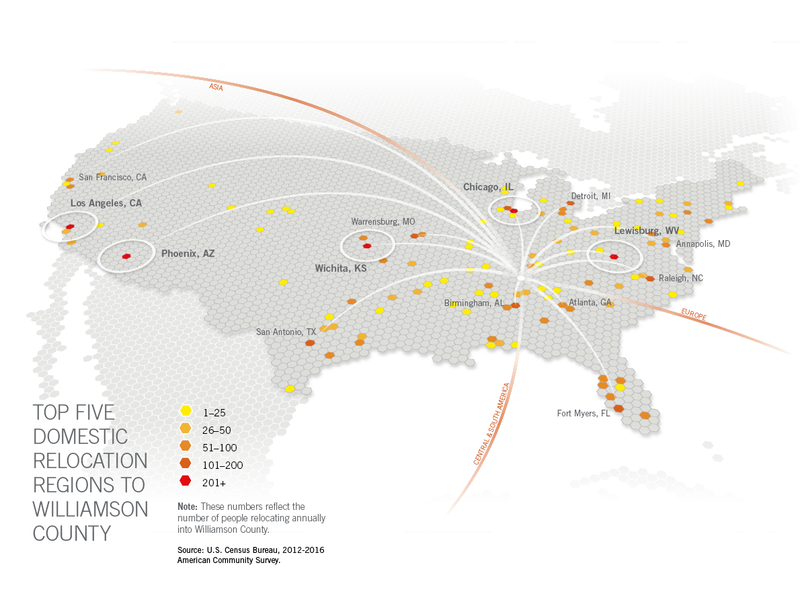 As the county and region grow, this migration helps cultivate our diverse metropolitan area.